Begining his journey in 2001, Curtis B released his debut single “Wanna Get Funky” on 321 Breaks. 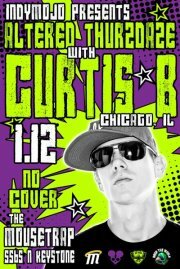 Since then, Curtis has grown to become an influence in the Breakbeat music scene. In 2003, he and Josh Lawton (Fresh Produce) formed “Elite Synthesis Project” (ESP). Dropping bangers like “Glad To Be Here”, “Kick A Hole”, and “Melt” earning them proper respect throughout the breakbeat community. In 2006 Curtis teamed up with Royal One & Fresh Produce records on a long line of remix and collaboration projects for digital and vinyl release. Curtis B utilizes creativity, skills, and influence, applying elements of electro, tearout, techfunk, 2 step, funky breaks, and house, to bring out the distinguished sound of his bass driven beat heavy music production. Special Happy Birthday to Matt Duncan & David Embry.